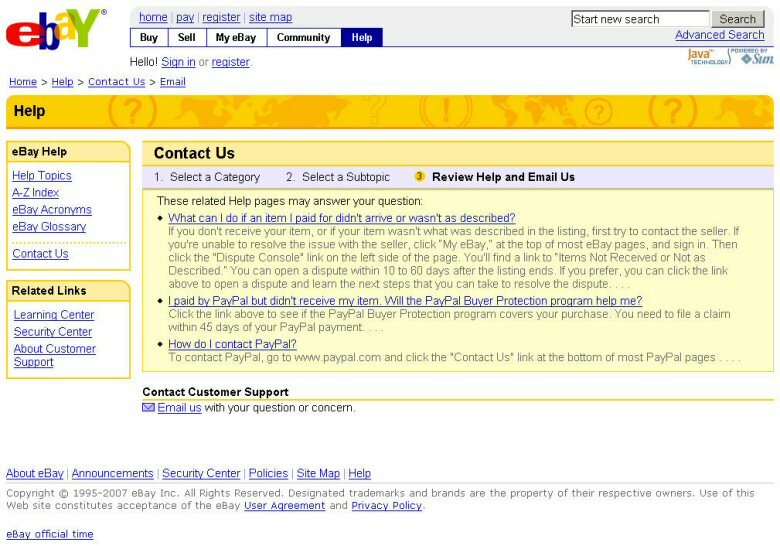 03/20/2007, eBay Has Still Not Fixed The Report Fraudulent Item Linking Problem! As I Reported Yesterday Afternoon, (Though I Used The Wrong Wording) Selecting The "Report This Item" Link At The Bottom Of ANY Listing Page, Brings Up The Below Page Of Contact Parameters, You Can See The Correct Ones Selected Below, As Obviously A 2007 Ford Focus Being Offered For $5100.00 Is A Scam! Also Going To The Security Center And Reporting A Fraudulent Item, That You Did Not Bid On, But Suspect Is Fraudulent, Produces The Same Results! And Ina Steiner, From Auction Bytes Reports The Same Problem! This Is Just INSANE!! 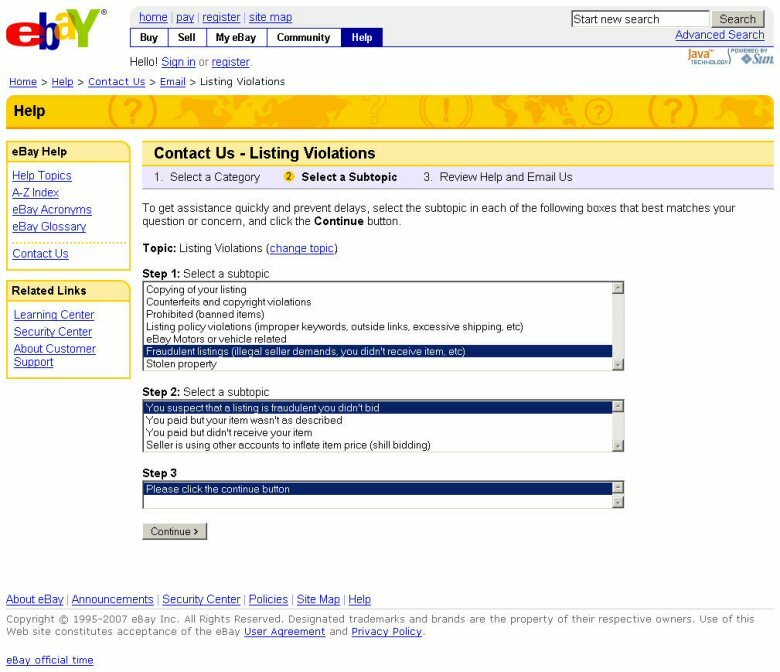 eBay Is Bordering On Harboring Criminal Activity, By Not Allowing FRAUD On Their Website To Be Reported! Next We Get The More Help Page With The Link At The Bottom To Contact Support! 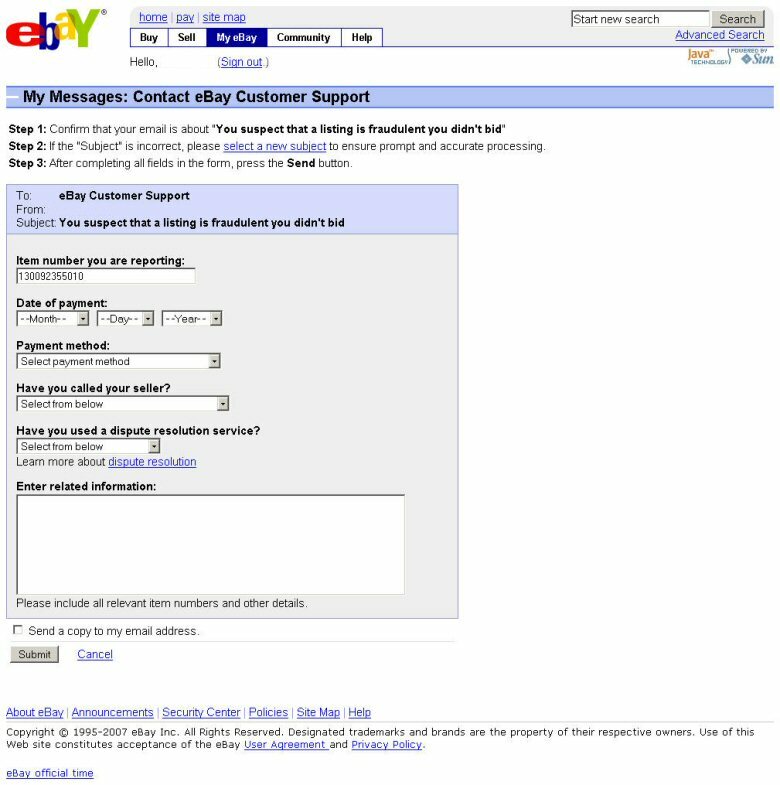 Clicking Email Us, Brings Up This Contact Form.. And There Is "NO OPTION" To Send A Report If You Have Not Paid For The Item! This Listing Just WREAKS Of A Scam! !